Oats. Millet. Quinoa. Amaranth. Buckwheat. Simple, right? 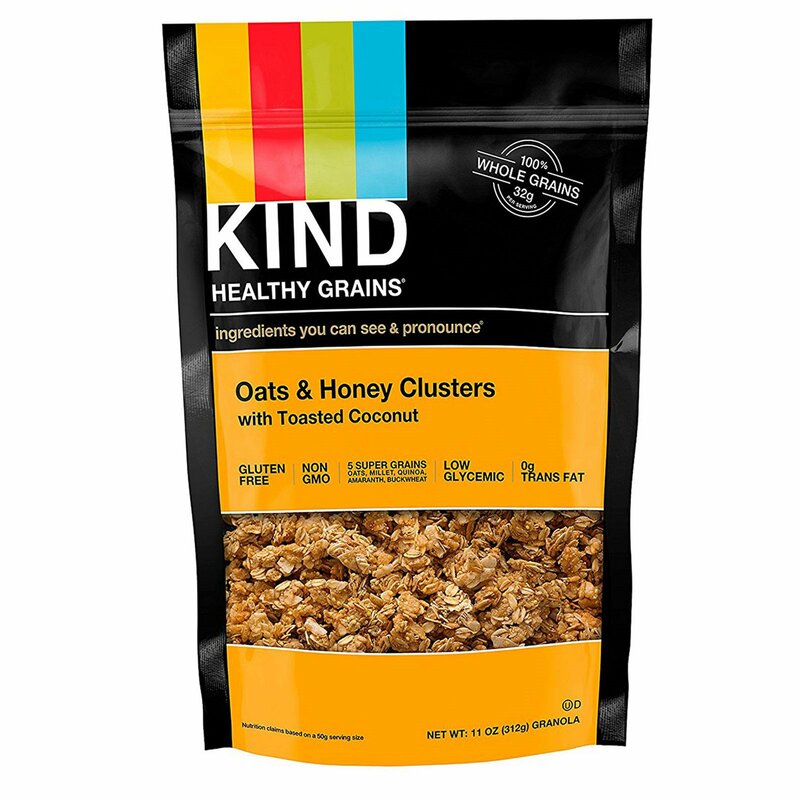 Kind Healthy Grains Clusters are delicious blends of wholesome ingredients including fiver super grains, making them the perfect snack for your active lifestyle. Low glycemic diets help maintain blood sugar levels that are already within a normal range. Welcome to the KIND community! Here at KIND, we think a little differently. Instead of "or" we say "and". We choose healthy and tasty, convenient and wholesome, economically sustainable and socially impactful is to make Kind not just a brand, but also a state of mind and community to make the world a little kinder. We call this the KIND Movement, which has inspired thousands of unexpected acts of kindness around the world. 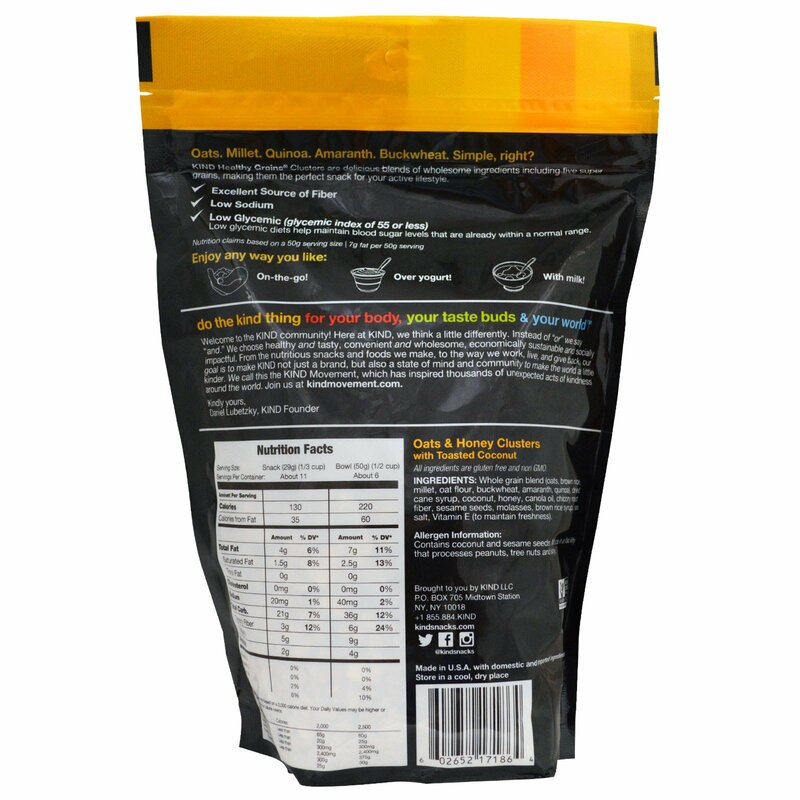 Whole grain blend (oats, brown rice, millet, oat flour, buckwheat, amaranth, quinoa), dried cane syrup, coconut, honey, canola oil, chicory root fiber, sesame seeds, molasses brown rice syrup, sea salt, vitamin E (to maintain freshness). Made in facility that processes peanuts, tree nuts, soy and sesame seeds. All ingredients are gluten free and non GMO.